For the 2017 racing season, Rinaldi Racing is back in the VLN. 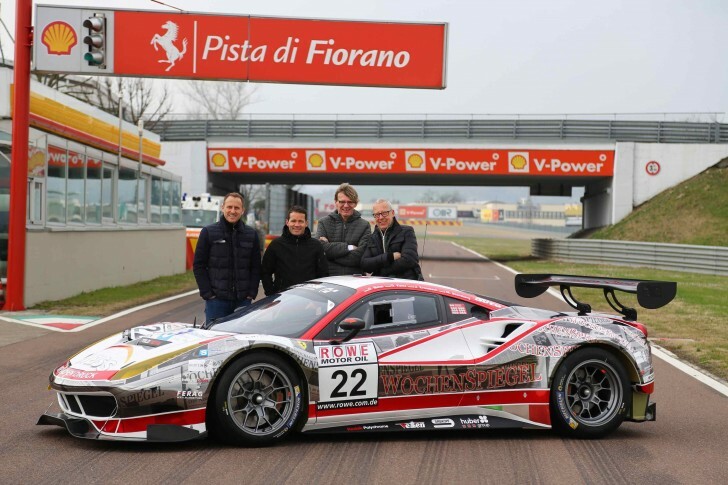 There the team from Mendig will be responsible for the Ferrari 488 GT3 of the Wochenspiegel Team Monschau. Georg Weiß, Oliver Kainz and Jochen Krumbach will share the work behind the steering wheel of the Italian sports car. For several races Mike Stursberg will support the trio. After having participated in the VLN 8 last year, they decided to go about the whole 2017 VLN season. „VLN 8 was a very good test for everybody. There the drivers adapted themselves to the car very well and managed the car at the first attempt. Therefore that they have never been behind the steering wheel of the Ferrari 488 GT3, it was a successful result for the whole team“, so team chef Michele Rinaldi. The drivers will start with the Ferrari 488 GT3 starting number 22 in the SP9 class in the Pro-Am classification. The Wochenspiegel Team Monschau will deploy additionally a Porsche Cayman 981 Clubsport GT4 in the SP10 class. The driver line-up will be Rene Offermann and Dirk Riebensahm. Next to the participation in the VLN, Wochenspiegel Team Monschau together with Rinaldi Racing is planning a start in the 24 hours Nürburgring as well as the corresponding qualifying race. The drivers will remain the same: Weiß, Kainz, Krumbach and Stursberg. In addition, it is planned to participate in the 24 hours Series from Creventic: at the end of August, Wochenspiegel Team Monschau and Rinaldi Racing will go to the 24 hours race Portimao in Portugal.